A group of genetically identical inbred mice are stabilized under identical conditions; half of them are then subjected to mild (0.3 g; g=acceleration of gravity) whole-body mechanical vibrations for a few minutes per day. After a few days, the transcriptional activity of hundreds of genes related to the musculoskeletal apparatus becomes significantly different between the two groups of mice. To explain this observation, we need to find the systemic relationship that links the accelerations experienced by the mouse's body with the transcriptional activity of its genes. Today, biomedical research faces many problems similar to the one above, which involve a level of complexity for which the traditional approach is inadequate. This approach is based on the subdivision of biological systems in some way - by dimensional scales (body, organ, tissue, cell, molecule), by scientific disciplines (biology, physiology, biophysics, bioengineering), or by anatomical subsystems (cardiovascular, musculoskeletal, gastrointestinal etc). However, these artificial subdivisions make it impossible to unravel the systemic nature that governs many of the physical manifestations of the human body. 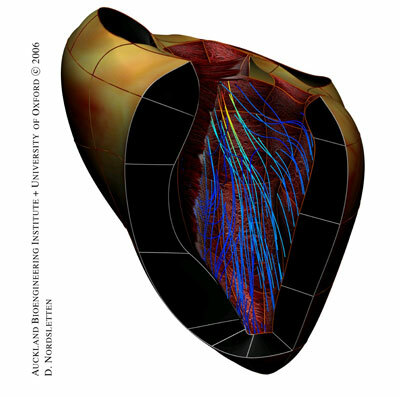 Oxford-Auckland multiscale model of a human heart, representing the anatomy, the muscles fibres orientation and the hemodynamics. Image courtesy of David Nordsletten and Nic Smith, University Computing Laboratory, University of Oxford. Scientific exploration of the human body has already dramatically improved the length and quality of the life for a significant proportion of humanity. In order to continue this exploration, it will be necessary to complement the traditional approach with an integrative approach that combines observations, theories and predictions across the temporal and dimensional scales, across the scientific disciplines, and across the anatomical subsystems, all of which reflect the rather artificial divisions described. This realization, shared by the vast majority of experts in the field, has given rise to a number of initiatives such as integrative biology, systems biology and study of the physiome. We believe that this integrative approach requires a radical transformation of the way in which biomedical research is conducted. It is necessary to create a framework within which observations and measurements from a variety of sources can be collected, shared and combined in many different ways. This framework should allow experts from a variety of disciplines to work collaboratively to analyse these observations and develop systemic hypotheses. It should also make it possible to combine predictive models defined at different scales or with different methods or with different levels of detail, in order to make the hypotheses concrete, and to allow their validity to be tested against existing results. Current investigations of the human body pretend that it is a jigsaw puzzle made of a trillion pieces, and we are trying to understand the whole picture by looking only at a single piece orperhaps a few closely interconnected pieces. It no surprise, therefore, that we are not finding it easy. In contrast, the scope of the EuroPhysiome Initiative is to promote the development of the Virtual Physiological Human (VPH), a methodological and technological framework that will enable investigations of the human body to consider it as a single (though hugely complex) system. The Virtual Physiological Human is the frame within which we can finally start to put all of the pieces together, and it is the glue that can connect them. The Virtual Physiological Human will not itself be the whole picture, but it represents our best pathway towards forming that picture at some time in the future. We claim that, given sufficient resources over the next ten years, the European Research System can develop the methodological and technological framework called the Virtual Physiological Human.. The STEP ('A Strategy for the EuroPhysiome') coordination action of this roadmap is to explicitly identify the essential requirements for developing the VPH and to specify what the objectives of this collective effort should be. In addition, the document describes the current state of knowledge; the challenges that the development of the VPH poses; the material, environmental, societal and other barriers that we will need to overcome; and the impact that we predict the VPH will have on research, industry, clinical practice and society at large. predictive: the framework should make it possible to interconnect predictive models defined at different scales, with different methods, and with different levels of detail, into systemic networks that provide a concretization of those systemic hypotheses; it should also make it possible to verify their validity by comparison with other clinical or laboratory observations. For more information on the VPH and on how the community of experts coordinated by the STEP action plans to pursue this ambitious goal, please refer to the VPH Research Road Map. If you would like to participate in the further development of this collective vision and receive all the recent news about the VPH and related initiatives, you are invited to join the Biomed Town Internet community.